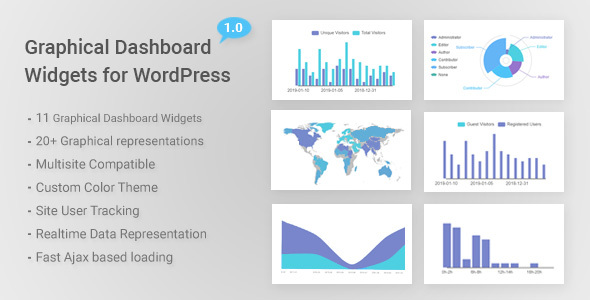 Graphical Dashboard Widgets for WordPress is a collection of wide range of dashboard widgets. These widgets display realtime data of your site in graphical or chart form. There are total 11 widgets with our 20+ graphs. Graphical statistics regarding users and site visitors, pages, posts, comments, user location, browser, platform, post category, online users etc. are represented on your dashboard. A graph showing information regarding the visitors visited on your site in last 15 days. It shows comparison ratio of total count of unique visitors by total visits on your site in last 15 days. It helps in keeping track of new and revisiting users on your site. A graph showing information regarding the users on your site in last 15 days. It shows comparison of the total count of visits by guest visitors and registered users on your site in last 15 days. There are 2 graphs in this widget. First graph shows the total count of browser used by users to visit your site in last 15 days. It shows the comparison of different browsers used. There are 2 graphs in this widget. First graph shows the total count of platform used by users to visit your site in last 15 days. It shows the comparison of different platforms used. This widget shows a count of users from various countries visited in last 30 days. This helps in comparing the location of users visiting your site. This widget shows the users on your site of current day by hours. User counts are divided by every 2 hours. It also shows the users currently online on your site. This widget displays a donut chart showing the count of each page type on your site. Published, Draft, Pending, Private etc. categorizations of page are shown in the graph. There are 3 graphs in this widget. First graph shows count of posts by month in each year. This helps in keeping track of number of posts published on your site in each month and year. Second graph shows the total count of posts published in each year. Third graph shows a donut chart showing the count of each post type on your site. Published, Draft, Pending, Private etc. categorizations of posts are shown in the graph. This widget displays a donut chart showing the count of each comment type on your site. Approved, Spam, Trash, Pending etc. categorizations of comments are shown in the graph. There are 2 graphs in this widget. These graphs shows count of posts in each category. First graph shows the most used post categories (means categories with most number of posts). Second graph shows the least used categories (means categories with least number of posts). First graph shows count of users by month in each year. This helps in keeping track of number of users registered on your site in each month and year. Second graph shows the total count of users registered in each year. Third graph shows a donut chart showing the count of each user role on your site. Administrator, Subscriber, Editor etc. categorizations of users are shown in the graph.